light microscopes and Light Microscope (LM) Facilities. I have been a Fellow of the Royal Microscopical Society for over 30 years, and have been teaching the principles of light microscopy since 1992. You will find links to the RMS, where I have served on Council and the Light Microscopy section. I have also supported the Royal Microscopical Society’s ‘Microscopes for every School‘ initiative for primary schools. For many years I was a member of the leading society for amateur microscopists, the Quekett Microscopical Club, and have been professionally associated with BioImaging UK. On the other pages, you will generally find downloadable PDFs in this part of the page. 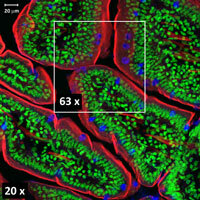 To the right you will see several images of mouse intestine. 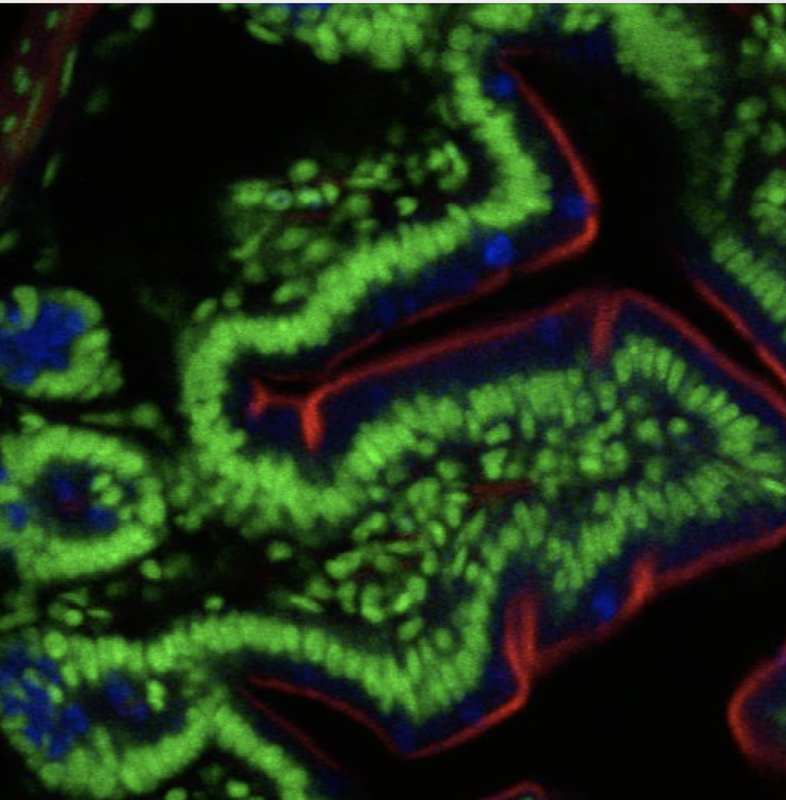 These were taken with a confocal microscope. 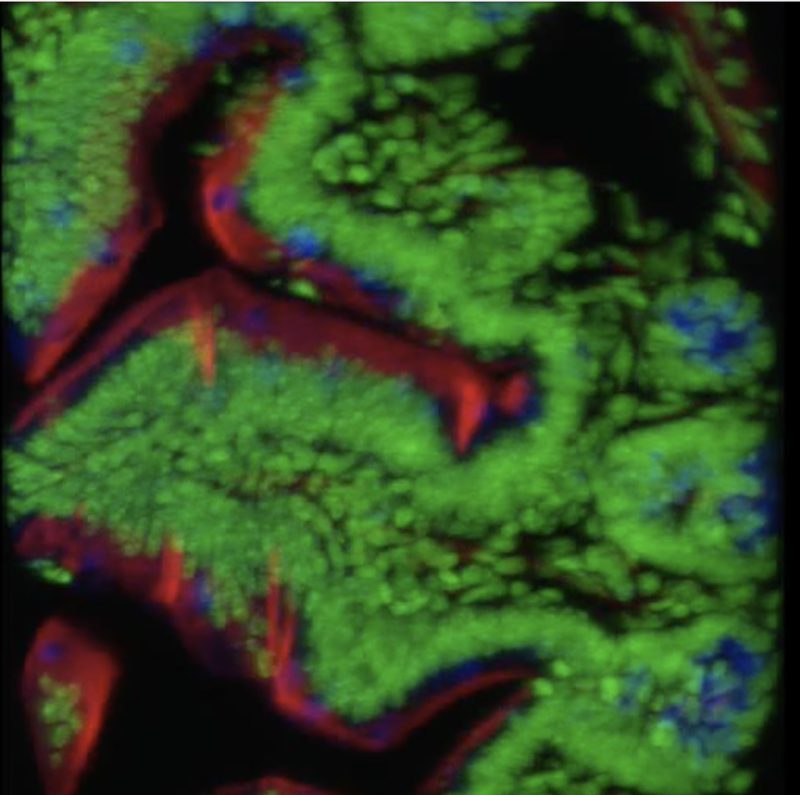 These images show you what is possible with a fluorescence optical sectioning microscope (if you cannot see these moving videos, it may be due to your connection bandwidth). Along the top bar you will see five sections, each with a pull-down menu. About Jeremy gives you some information about me and my work as a microscopist. The internet is not peer-reviewed; it is your choice whether you wish to use the information presented on this website. I think that you are entitled to know something about me, and you can find it on this page. Usually when the media wish to depict science, or interview scientists, the microscope is the instrument called for when a symbol is required to depict our profession to the non-scientist. The microscope is also unique amongst scientific instruments in that it will deliver an image however badly it is set up. Generally, other instruments will not do this. In order to be confident in your use of the microscope, and the images obtained, these pages are here to guide you in properly setting up and using the microscope for research. Essential Techniques will inform you about the purpose of the microscope, how to set it up properly, and how to use a microscope for brightfield or fluorescence work. Different contrast techniques, as well as the main applications of optical sectioning for fluorescence microscopy, are also explained here. General Techniques will help you decide which microscope to use for your work and which fluorophore to use. This page will also give you tips on collecting good images, as well as advice on how to care for objectives – which are, after all, the main part of the microscope. My Books is ‘exactly what is says on the tin’. Here you will find details of my forthcoming book on Understanding Light Microscopy and also Biological Microtechnique the specimen preparation and histology text I wrote. Other Information is exactly that! You will find a description of what I have written about running and managing light microscopy imaging facilties here, as well as URL links to imaging facilities, and other informative websites that I have found useful. NB Please only use the downloadable resources and academic papers on this website for your own personal study and tuition. They are not to be multiply-distributed, or exploited for commercial use. I hope that you enjoy my space on the World Wide Web!